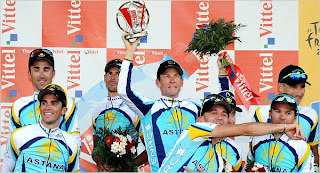 Question: If Armstrong jumps into the yellow jersey on friday and recieve the backing of Johann and the team, does Contador abandon in protest? Also, do you believe the contraversy? Contador did take a monster pull at the end of the TTT to help that stunning Astana win. It's not a question of who gets the backing of the team, but of who will be stronger in the mountains. Bruyneel will send them up a mountain together and see who lasts the longest. I don't believe the controversy. Armstrong and Contador did long pulls at the front because they knew they could take time out of their rivals. One other question I forgot about. Will you weight in on the great radio debate? Stage 3 had unexpected results and teams in full communication could not organize properly to catch the Columbia-HTC & friends train. Stage 5 the breakaway survived even with cooperation from Columbia, Garmin, Saxo, Astana, ect. Yes it was only 7 seconds on stage 5 and both were wind assisted chaos, but are radios really bad?